What does a typical day in the life of Kyle Hughes-Odgers look like? I wake up, hang out with my son, coffee, emails, catch the train to my studio in Fremantle, coffee, painting, emails, go home, hang out with my son. Amongst many other achievements, you’ve written and illustrated your own children’s books including titles such as ‘Ten Tiny Things’ and ‘Can a Skeleton Have an X-Ray?’. What drew you towards creating work for children? Children's books are still broadly accepted in the conservative adult world when they are very strange and unique. I have always loved this, like little creative revolutions sitting patiently waiting to be considered in homes around the world. When I was small it seemed like a dream that adults could draw and make strange books for a living. Most of my work is narrative based so a children's book is a good way of extending concepts and ideas. Much of your work is quite soft and playful in colour and subject matter. Where do you draw your inspiration? I make lots of notes around narratives and concepts I find interesting / little drawings of compositions or spacial balance that I might see in nature and want to remember. I like to use colours that are more sophisticated and muted than loud and obnoxious. Do you feel as though your style has changed much over time? Yes, it is constantly changing. 12 years ago I only drew black and white posters of people with tattoos and 10 double chins. I think it's important it grows and moves as I get older and moves with what I find interesting. 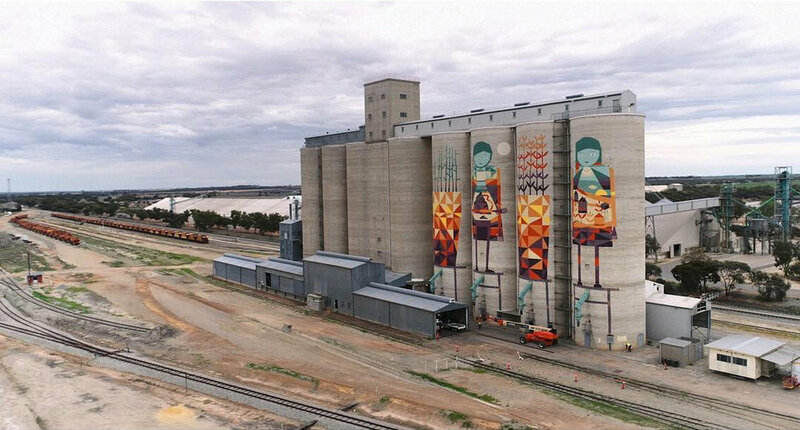 You recently completed the painting of 4 silos as part of Art in the Wheatbelt. Tell us a bit about the project! I was commissioned to paint 4 x 35m silos in Merredin in the wheatbelt of Western Australia. The work is part of a bigger project called the public silo trail in Western Australia and aims to cast a light on these beautiful, distinctive regions. Tourism maps will connect the completed silos for visitors to tour. It was a great and challenging project to paint at such an extreme scale. "I was commissioned to paint 4 x 35m silos in Merredin in the wheatbelt of Western Australia. 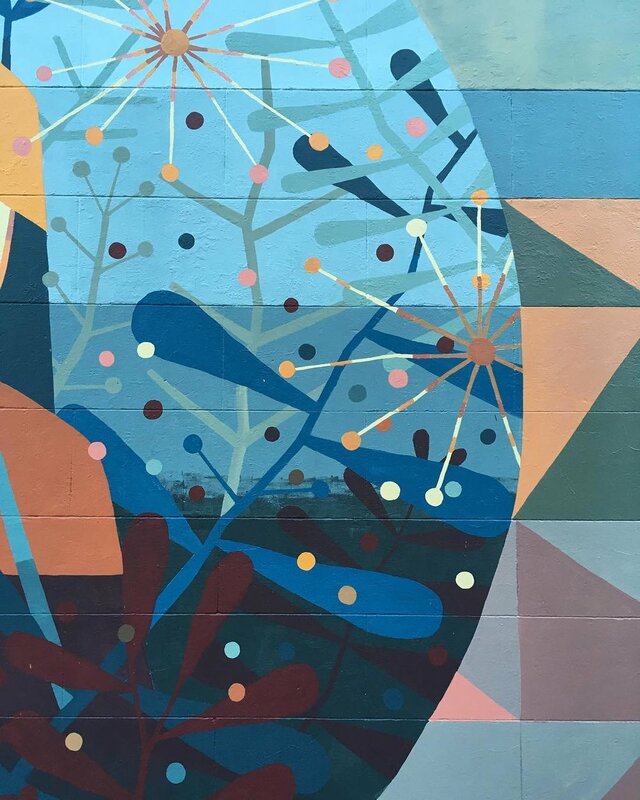 The work is part of a bigger project called the public silo trail in Western Australia and aims to cast a light on these beautiful, distinctive regions." Is there anything you aim for people to take away from your art? Recently I have been actively trying to make more positive narratives / works rather than focusing on the negative. Making paintings about celebrating human problem solving and ingenuity and also playing with colour and abstraction. Focusing on the broader idea of human spirit. More public art, I have solo exhibitions in Madrid and Melbourne next year, and working on more book ideas. Any advice for the kids of tomorrow? 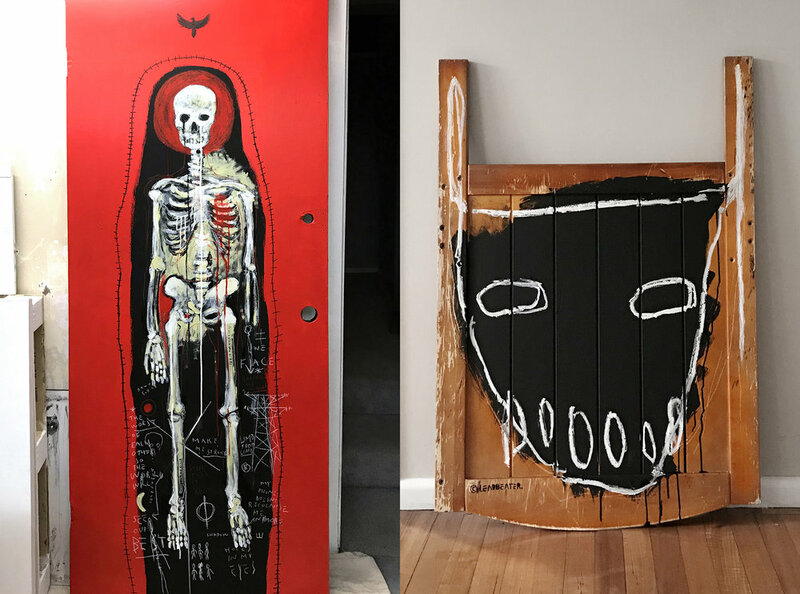 Don't wait to be magically basquiated into the artworld. Work really hard.